Kling og Bang, the artists collective from Iceland, will commemorate Sirkus, a Reykjavik bar, landmark, and hub of the alternative arts scene, which is due for demolition. Kling og Bang will save its facade and interior and re-erect it at the Frieze Art Fair, like a circus moving to another town. A zany nomadic act reflecting the drive of Icelandic art, producing a situation of one circus within another for artists to respond to. 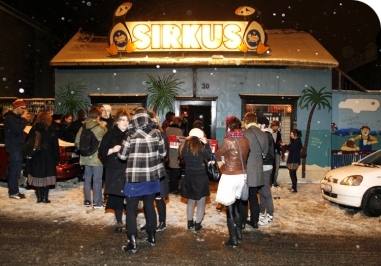 Sirkus, a bar in the scruffy downtown area of Reykjavik, was demolished this spring after serving for nine years as a living landmark and the hub of the alternative arts scene. In a zany nomadic act that reflects the drive and spirit of Icelandic art, Kling & Bang, a gallery run by eight enthused artists, has not only helped the owner, Sigga Boston, save the bar’s facade and interior, but also resolved to bring it to the UK and re-erect it at the Frieze. A place of celebration and creation will move town for a few short days, like the travelling circus invoked by the bar’s name. Kling & Bang was set up five years ago and has since hosted and collaborated with a wealth of renowned international and Icelandic artists, and consistently presented challenging and often unprecedented works of art. But like many downtown institutions, not least Sirkus, its life has always been on the brink, waiting for the day the bulldozers come. Kling & Bang had to move into new temporary premises early this year after months without a roof. Its daughter organization, the art resource centre Klink & Bank, was less fortunate: it closed forever when forced to leave its location in a disused factory after two years providing studios, admin facilities and performance spaces for hundreds of artists, musicians, filmmakers etc. But change has come to be a part of the Reykjavik art scene, and last summer Kling & Bang played with its transient existence by setting up temporary headquarters in Berlin. And now instead of exhibiting in a white box it is coming to London with its very own building, placing a Sirkus in the heart of the art fair. But ultimately what Kling & Bang will be bringing is not simply a physical construction, not just its erstwhile facade gauchely painted with palm trees and the crumbling interior with its years of accumulated detritus, but the aura and the values the bar embodied. Far from a nostalgic attempt to freeze the past or place it, neatly labelled, in some art archive, or to be merely satisfied with the absurd act of transporting the building elsewhere, Kling & Bang will be bringing living memories and potentialities that catapult the bar’s meaning into a new present. Like a real travelling circus which for a few short hours suspends the humdrum world and takes us out of our workaday lives, once erected in London the Sirkus bar will act as a flaw in the fabric of time and space, creating a rupture in the art fair proceedings and a zone where real life will radiate. Through this intervention, the bar with its scintillating memories will act as a springboard that allows visiting artists to respond to the dialogic situation between a circus bar and an art fair circus – between host and partner, home and abroad, inside and outside, core and surface, past and present – which doubtless will prove every bit as entertaining in London as the Sirkus bar was in Reykjavik.